This timelapse shows you the process of how I draw a top down token for Roll20. 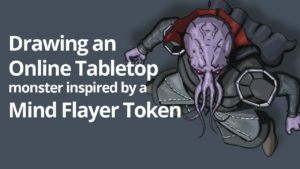 It is a virtual tabletop token that can be used to play games such as Dungeons and Dragons online. 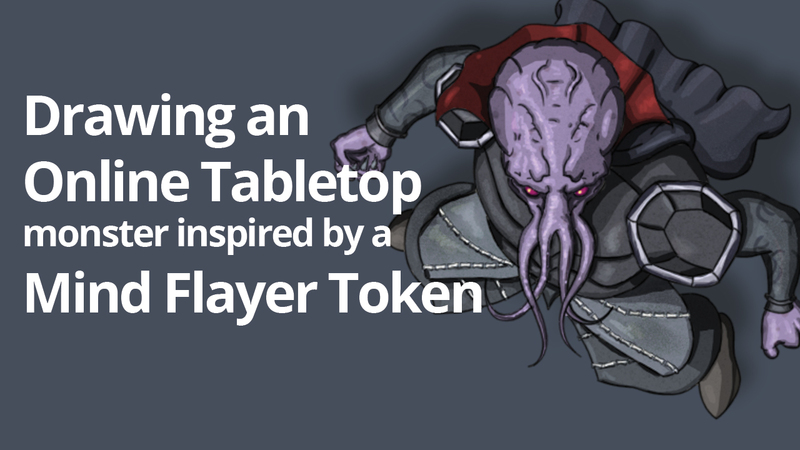 This token resembles a creature inspired by a Mind Flayer. The brainsucking creatures that live in the Underdark of the Forgotten Realms fantasy world. The process starts by posing a figure in the Daz Studio or Daz 3D posing program. When I am satisfied with the pose, I render it and import it in Adobe Photoshop. I then use a blue brush to sketch out the character. Sometimes I copy and paste and mirror pieces of the artwork such as for the head. Since the head is mostly Symmetrical. When I am satisfied with the sketch, I put the sketch layer on 50% opacity, and create a lineart layer on top. I draw the line art with thin black lines. The lines and curves need to flow, so I often undo and redraw the line art. When the line art is finished. I select the outside area, and create a mask. Then I reverse the mask, so I can draw inside of the lineart, and I don’t accidently go out of the lines. After the values are finished. I create a layer set on Hard Light, and I start drawing in the colors that I like. Everything comes together here. The last layer is a layer of color dodge. 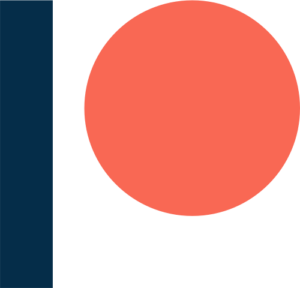 This gives some life to the character, by changing colors slightly and adding ‘glowing effects’. If you enjoyed this video. Please like us on our facebook page and check my artwork on the Roll20 Marketplace.